Altes Rathaus is the central landmark of Bonn frequented by tourists and aficionados of antiquated collections. It is the official residence of the Mayor. 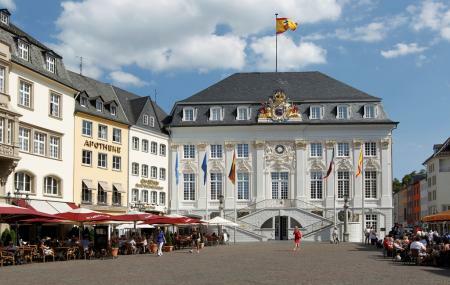 Located on the three-cornered market square, the 18th century building is the welcome house for celebrities and state leaders visiting Bonn. Designed by Micheal Leveilly, Altes Rathaus is an embodiment of Rococo architecture blended with local aesthetics. The 3-storey building was completed in a year’s time in 1738. It has seven window axes with dormers on a mansard roof. It offers a towering view of the eclectic Bonn landscape. The entries made by celebrities feature in the Golden Book. The building houses the registry office to conduct marriage ceremonies. Most of the old structure and alley have been recently renovated with high-end sanitation and an air-conditioned hall. Since it’s an official residence, entries could be restricted on account of visits from a state leader. Maintain silence and switch off your cell phones ones inside the church. Photography is prohibited inside the hall. You can participate in the marriage ceremonies. Stairs and elevators are available to the upper floors. People normally club together Alter Friedhof and Beethoven-Haus Museum while planning their visit to Altes Rathaus. People also prefer to start their day with Altes Rathaus.